We had the welcome luxury of sleeping in today since we did not need to leave our apartment until 10:45 AM for our first appointment — although some of us were woken up early by the busy morning sounds coming from the well-populated street just below our windows. Corey cooked us another delicious breakfast of soft boiled eggs, bacon, and hearty toast. We then traveled by train to Hillerød station. When we emerged from the station, it seemed that we were in a small town—one would not have suspected that there was something as grand as a castle nearby! We walked through the small town full of shops, bustling with people enjoying their lunches. Turning a corner, we finally saw the looming, grand Frederiksborg Castle, surrounded by a moat and a beautiful lake. Bine Bryndorf, the castle organist, warmly greeted us and brought us into the gorgeously ornate castle chapel, which was built in 1617, and we went up the spiral staircase to the Compenius organ. 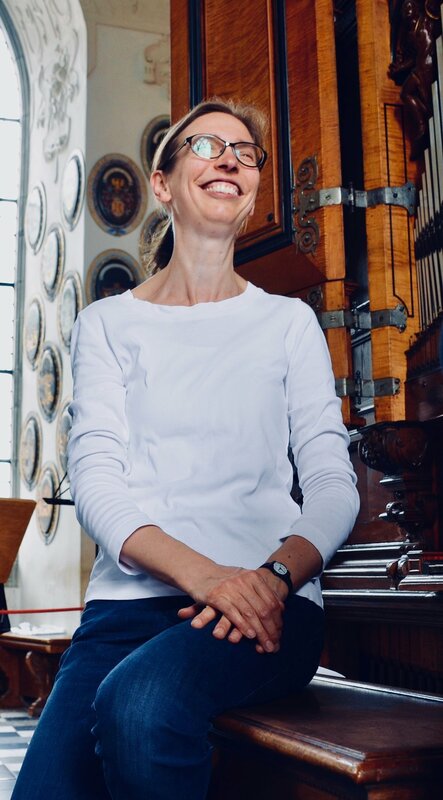 Castle organist Bine Bryndorf unlocks the 1610 Compenius organ, Frederiksborg Castle, Hillerød, Denmark. At first glance, the instrument looks like a fancy chest — except for the hand-drawn bellows at the back of the organ, one might not guess it is an organ! At 1:30 pm, Bine (literally!) unlocked and unpacked the beautiful, one-of-a-kind Compenius organ piece by piece. Amazingly, each part of the organ needs to be opened with a different key, and there is only one set of keys to this organ (now more than 400 years old) in the entire world! While we listened, Bine performed the weekly Thursday recital on this organ, transporting us back to Renaissance times. Her enjoyment of this unique, beautiful organ was palpable through her delightful rendition of Buxtehude’s variations “Aria La Capricciosa” — each variation showcased the different, characterful sounds of this instrument; it was as though Bine was further unpacking the organ for us through its different sound colors. Castle organist Bine Bryndorf coaches Chris Porter on Buxtehude, 1610 Compenius organ, Frederiksborg Castle, Hillerød, Denmark. After Bine performed, we each got a turn to look at the organ more closely and play on it. 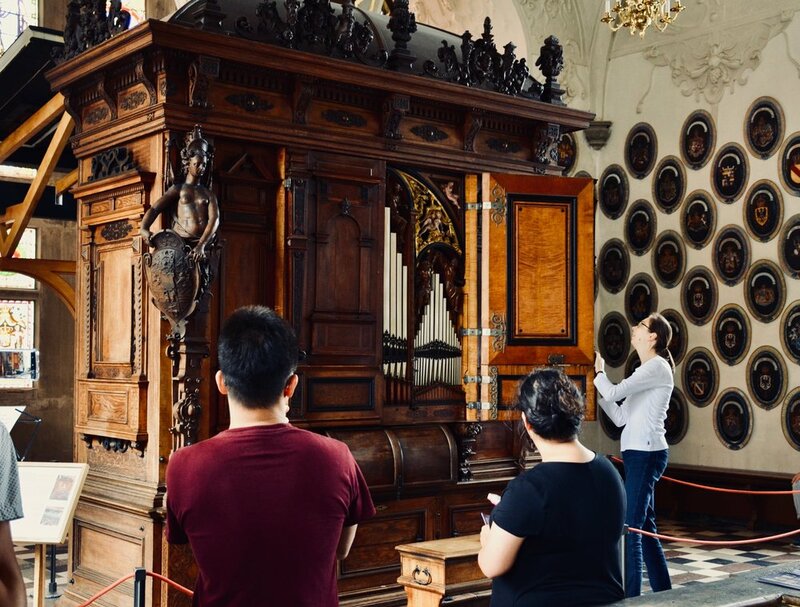 The instrument has a fascinating history: it was built in 1610 by Esaias Compenius as a secular house organ for Duke Heinrich Julius of Braunschweig-Wolfenbüttel. 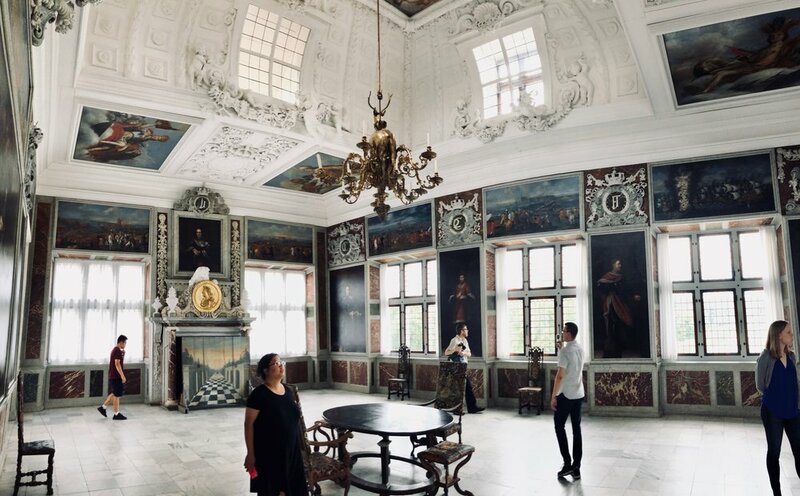 It was later moved to Frederiksborg Castle as a gift to Denmark’s King Christan IV and erected in the chapel, in the same spot it currently sits, in 1617. 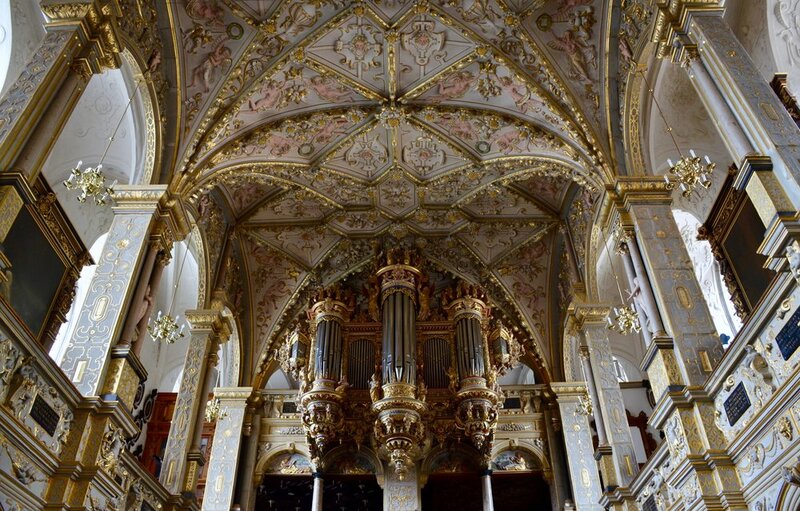 The first account of this organ was written in 1619 by Duke Heinrich Julius of Braunchweig-Wolfenbüttel’s kapellmeister, Michael Praetorius, who was a well-known organist, composer, and music theorist. During Christian V’s reign, the organ was moved to the Great Hall, where it entertained guests at banquets there. It was gradually used less and less frequently until when in 1790, it was moved to Frederiksberg Castle in Copenhagen. This meant that the Compenius organ thankfully survived the fire that burned down Frederiksborg Castle in 1859. After the fire, the organ was moved back to the chapel of Frederiksborg Castle, where it still stands today. Keydesk and façade detail, 1610 Compenius organ, Frederiksborg Castle, Hillerød, Denmark. The organ is made entirely of wooden pipes — mainly oak, covered with ivory and ebony. There are also pipes made of boxwood and walnut. There are 1001 pipes in total, with 9 stops in each division. The pedals are made of ivory; none of us had ever encountered an ivory pedalboard! There are so many fascinating facets to this organ — Bine said that the builder seemed to really have a lot fun when constructing it. For example, the pedalboard is camouflaged as a drawer that can be pulled out when the player wants to use it. The stops each have faces on them — women’s faces for the upper keyboard, lions’ faces for the lower keyboard, and men’s faces for the pedals. Each key also has the face of an angel on it. There was a small door to the left of the keydesk, behind which there are several pipes that will produce drone sounds (both high and low pitch ones) that are reminiscent of bagpipes. These are activated when the knob with a jester’s face on it is pulled — these drones are also useful for improvisation. There is also a knob with an owl on it that produces a drum sound when pulled. We took turns playing works by Buxtehude, Sweelinck, and Tunder, and we could not seem to get enough of this organ. The meantone tuning of the organ meant that we experienced some very interesting harmonies. By this time, we had become a bit more accustomed to the keyboards' short octaves (thanks to playing many short octaves on this trip). The key depth was also quite shallow, reminiscent of some of the clavichords that we had played at Hans and Ulrika Davidsson’s house a few days prior. Pumping the bellows, Castle organist Bine Bryndorf coaches Adrian Cho, 1610 Compenius organ, Frederiksborg Castle, Hillerød, Denmark. Bine coached each of us as we played, helping us explore the tonal possibilities of this organ with each of our pieces. We marveled at the incredible range of sounds — from raspy reeds to heavenly flutes — coming from an organ made of all wooden pipes. We also took turns pumping the four bellows, with Corey taking the lion’s share of providing air for us to play. Corey definitely was the star of many photos of the organ taken by tourists that day. Adrian Cho is a YouTube star, as a sea of tourists record his performance of Sweelinck. 1610 Compenius organ, Frederiksborg Castle, Hillerød, Denmark. Just before the castle closed at 5 PM, we (a bit reluctantly) left the organ and Bine led us through the beautiful rooms of the castle to the Audience Room and the ornate Great Hall with its trumpeters’ balcony. Some of us imagined living in such a beautiful castle and how delightful it would be if we could play the Compenius organ every day! Members of Boston Organ Studio, Frederiksborg Castle, Hillerød, Denmark. After we said goodbye to Bine and the castle, we went to a gelato café nearby. There, we had some very tasty gelato, enjoying flavors such as super dark chocolate, pistachio, stracciatella, and black cherry. We then headed back to the train station and went home to our apartment. Brandon cooked us a delicious meal of orecchiette pasta with lamb and pesto, with a dessert of strawberries and cream — our go-to homemade dessert on this trip. After dinner, we sat around the table enjoying each other’s company as today was also our last day as a larger group, since Brandon and Corey were leaving the next morning to fly back to Boston (we were sad that they were leaving us early!). We then headed to bed after a very satisfying day. It’s hard to believe that tomorrow is our last day of this wonderful study trip! Boarding the train to Hillerød, Denmark. Corey De Tar and Laura Gullett arrive at Frederiksborg Castle, Hillerød, Denmark. 1617 Chapel and 1610 Compenius organ, Frederiksborg Castle, Hillerød, Denmark. Chapel, Frederiksborg Castle, Hillerød, Denmark. Statuary detail, Chapel, Frederiksborg Castle, Hillerød, Denmark. Altar, Chapel, Frederiksborg Castle, Hillerød, Denmark. Chapel organ, Frederiksborg Castle, Hillerød, Denmark. 1610 Compenius organ, Frederiksborg Castle, Hillerød, Denmark. Castle organist Bine Bryndorf performs on the 1610 Compenius organ, Frederiksborg Castle, Hillerød, Denmark. Castle organist Bine Bryndorf introduces the 1610 Compenius organ, Frederiksborg Castle, Hillerød, Denmark to members of Boston Organ Studio. Keydesk detail, 1610 Compenius organ, Frederiksborg Castle, Hillerød, Denmark. Façade detail, 1610 Compenius organ, Frederiksborg Castle, Hillerød, Denmark. Castle organist Bine Bryndorf coaches Adrian Cho on Sweelinck. 1610 Compenius organ, Frederiksborg Castle, Hillerød, Denmark. Ivory pedalboard detail, 1610 Compenius organ, Frederiksborg Castle, Hillerød, Denmark. Laura Gullett pumps the bellows. 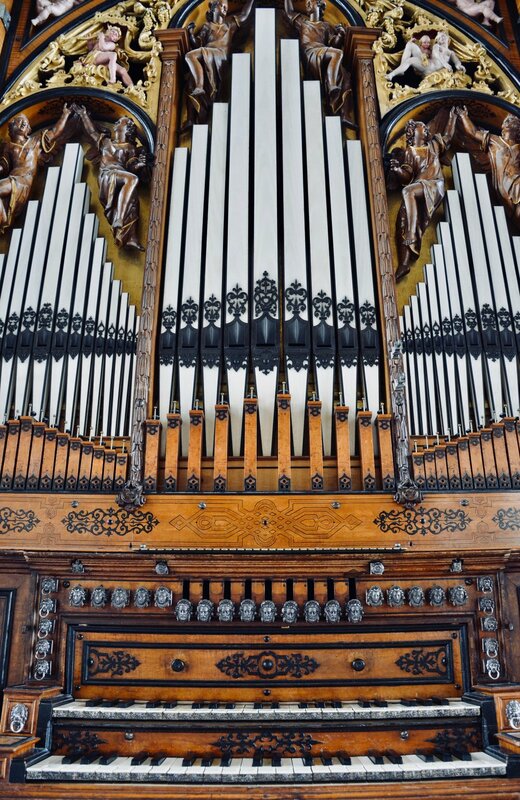 1610 Compenius organ, Frederiksborg Castle, Hillerød, Denmark. 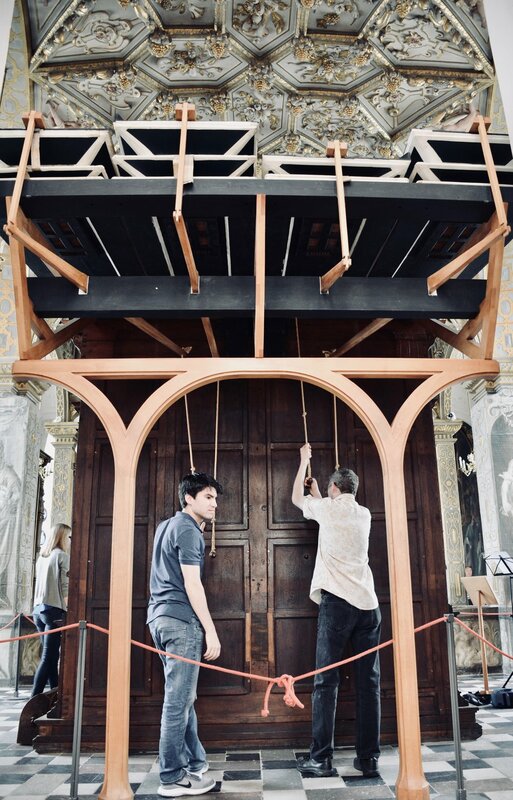 Brandon Santini and Chris Porter pump the bellows, 1610 Compenius organ, Frederiksborg Castle, Hillerød, Denmark. Castle organist Bine Bryndorf coaches Jennifer Hsiao, 1610 Compenius organ, Frederiksborg Castle, Hillerød, Denmark. Castle organist Bine Bryndorf, 1610 Compenius organ, Frederiksborg Castle, Hillerød, Denmark. 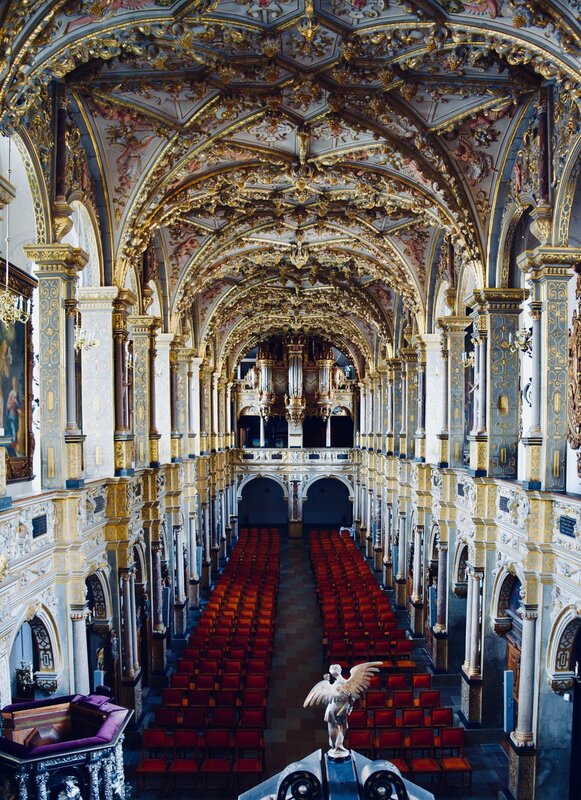 Laura Gullett plays Buxtehude, 1610 Compenius organ, Frederiksborg Castle, Hillerød, Denmark. Castle organist Bine Bryndorf coaches Chris Porter, 1610 Compenius organ, Frederiksborg Castle, Hillerød, Denmark. Jennifer Hsiao listens to the 1610 Compenius organ, Frederiksborg Castle, Hillerød, Denmark. Castle organist Bine Bryndorf opens the bench compartment, 1610 Compenius organ, Frederiksborg Castle, Hillerød, Denmark. Castle organist Bine Bryndorf points out features of historic pipework, 1610 Compenius organ, Frederiksborg Castle, Hillerød, Denmark. Pipework detail, 1610 Compenius organ, Frederiksborg Castle, Hillerød, Denmark. Castle organist Bine Bryndorf coaches Brandon Santini, 1610 Compenius organ, Frederiksborg Castle, Hillerød, Denmark. 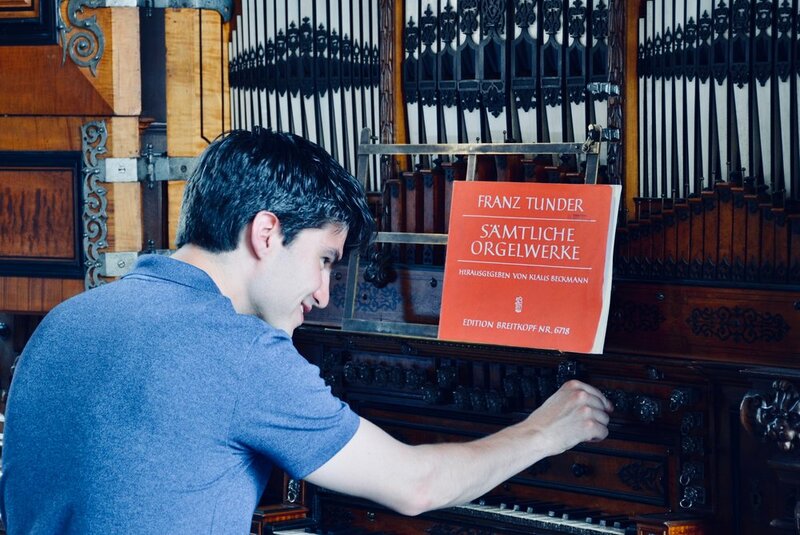 Brandon Santini admires the silver stop knobs, 1610 Compenius organ, Frederiksborg Castle, Hillerød, Denmark. Stopknob detail, 1610 Compenius organ, Frederiksborg Castle, Hillerød, Denmark. Jennifer Hsiao admires the keyboard carvings, 1610 Compenius organ, Frederiksborg Castle, Hillerød, Denmark. Chris Porter listens to the 1610 Compenius organ, Frederiksborg Castle, Hillerød, Denmark. Castle organist Bine Bryndorf coaches Corey De Tar, 1610 Compenius organ, Frederiksborg Castle, Hillerød, Denmark. Christian Lane plays the 1610 Compenius organ, Frederiksborg Castle, Hillerød, Denmark. 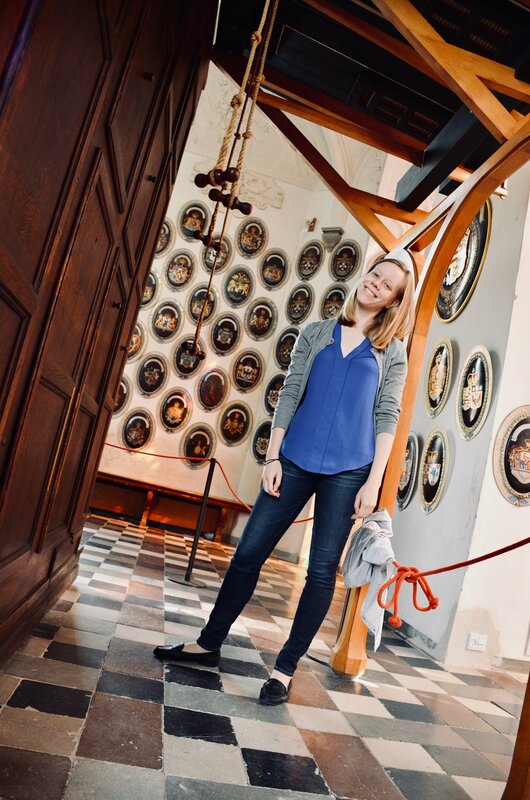 Laura takes a break from pumping the bellows, 1610 Compenius organ, Frederiksborg Castle, Hillerød, Denmark. Castle organist Bine Bryndorf locks compartments of the 1610 Compenius organ, Frederiksborg Castle, Hillerød, Denmark. King’s reception room, Frederiksborg Castle, Hillerød, Denmark. The Great Hall, Frederiksborg Castle, Hillerød, Denmark. 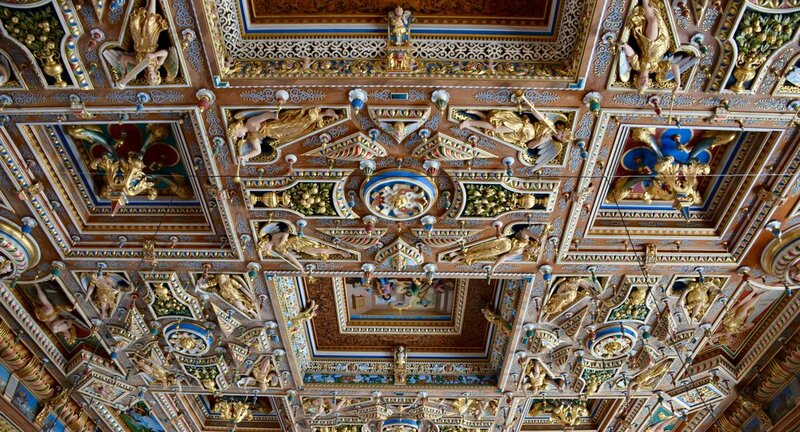 Ceiling detail, The Great Hall, Frederiksborg Castle, Hillerød, Denmark. Members of Boston Organ Studio at Frederiksborg Castle, Hillerød, Denmark.